Hamilton Island is the perfect place to relax, but also offers a great range of activities for the whole family to enjoy. You can choose to do as much or as little as you like, with over 60 activities available throughout the island. Cruise the Great Barrier Reef and snorkel or dive the crystal waters, laze in the shade of a palm tree, work on your tan on the pristine white sands of Whitehaven Beach or shop and dine on the lovely marina. Hamilton Island is a haven for kids and families, with a number of programs, activities and kids clubs in place to provide supervised and safe fun for all ages. Enjoy visits to the beach, fishing, games, arts and crafts and more. There’s also a variety of water sports, an 18-hole championship golf course, the famous Wild Life Hamilton Island experience and even go karting! 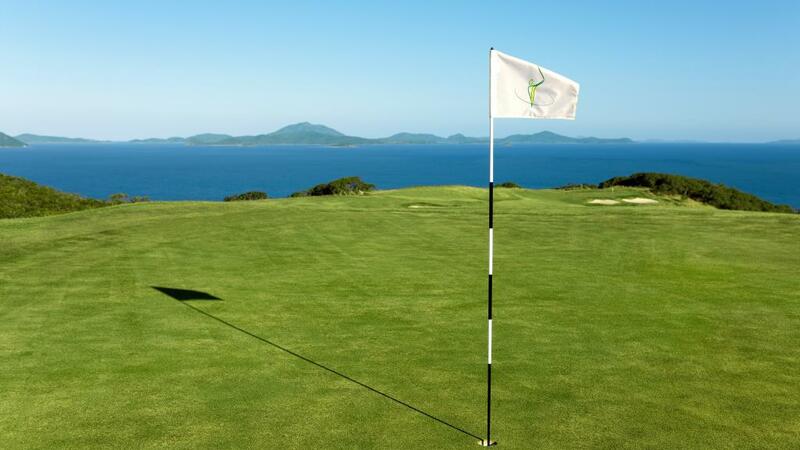 Hamilton Island Golf Club's oceanfront links are just a five-minute ferry ride away on neighbouring Dent Island. The world-class par 71, 18-hole championship course makes the most of the island's valleys and ridges, with challenging dunes and 360-degree views of Hamilton Island and the Whitsundays. To celebrate that eagle or hole-in-one round, relax with a leisurely meal in the clubhouse restaurant and bar. On Hamilton Island, kids 0 to 12 years stay for free when sharing with parents and using existing bedding. The Kids Stay and Eat for free offer is not available to conference delegates. In-room babysitting is available on request. Babysitting charges are available from Reception during your stay. The Clown Fish Club is an organised day care and child care activities. This facility offers high quality care and is operated by fully qualified childhood leaders. Open Tuesday - Saturday from 8.30am to 5.00pm for children aged between 6 weeks and 14 years. During school holiday periods the Kids Club extends to Monday - Saturday. Choose from the following 3 sessions. Bookings are essential, but not accepted prior to arrival. It is suggested that guests visit the Clownfish Club on arrival to Hamilton Island. Special rates are available for families with multiple children as are extended visitor passes for longer guests. Meals are not provided for small babies. Bottles and baby food must be supplied if required. Full and half days are available for parents participating in organised tours (conditions apply). Rates for all sessions are available on application and subject to change. Hamilton Island has a range of restaurants catering for families. Apart from fish and chips on the Marina, Hamilton Island also has a number of restaurants that participate in the Kids Eat Free program. These restaurants include Pool Terrace Restaurant (lunch & dinner), Manta Ray Cafe (breakfast, lunch & dinner), Sails Steak & Seafood Grill (breakfast, lunch & dinner), Wild Life Hamilton Island (breakfast only), and coca chu (dinner only). Please note restaurants are subject to change where children 12 years and under eat free from the children's menu when dining with parents before 7.30pm.